For a westerner who is new to Chinese cuisine, might find certain Chinese food intriguing due to unfamiliarity. Chinese foods can widely differ from western style cooking. Exotic in the way it looks, smell, how it’s eaten and how it’s prepared. Hot Pot is much different than other food outside of Asia. Hot Pot is not just a dish, it’s cultural. It may seem mysterious to those who haven’t seen it for the first time. With that in mind, let’s shed light on 10 secrets of Hot Pot. Chengdu and Chongqing are in a deadlock for most popular Hot Pot destination. These two cities are synonymous with the dish. If you speak of these two cities, someone is bound to mention Hot Pot sooner or later. Many regions of China have their own version but most like to imitate the spiciness of Sichuan. Travelers from all over specifically go to these two areas to have a taste. As just mentioned, Chengdu and Chongqing are most famous for Hot Pot restaurants but Hot Pot originated around Northern China and Mongolia during the Chinese Jin Dynasty. Eventually spreading throughout China after each dynasty in succession. After passed on from hundreds of generations, modified versions have taken place of the original. Although Chongqing Hot Pot adds an abundant amount of red hot chili peppers and black peppers, it’s still shares similar traits to Chengdu’s Hot Pot. This is mainly due to Chongqing neighboring close to Sichuan and was also previously a part of Sichuan before it later separated into its own municipality. Due to the fact each province and each part of China have their preference in cooking style and seasonings, this had led to many variants of Hot Pot catering to local areas. To list a few are, Sichuan style, Mutton Hot Pot, Cantonese Shacha Hot Pot, Yuanyang Hot Pot and lots more. Usually when people are introduced to Hot Pot, they’re usually placed in front of a huge boiling pot. There are pot splits that allow 2 soup choices, hot or non-hot. Another style is the mini-hot pot that is used to serve to individuals or single persons. An additional style is known as ChuànChuàn, this prep style is similar to kebabs, only they’re boiled in the Hot Pot. 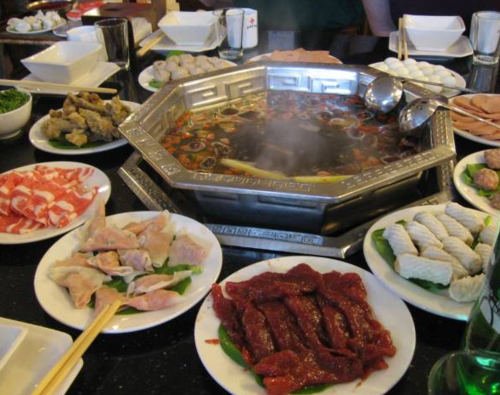 Normally, Hot Pot is brought to a boil either by an electrical base or flame fueled by propane and butane tanks. With China’s long history dating back over 5,000 years, it’s debatable that Hot Pot could possibly be the first form of an all you can eat buffet. Seeing how there is no limit to the servings that can be added to a hot pot meal and a person can come back for many helpings, especially if a big pot is used in a gathering meant to serve dozens of people. Hot Pot is a meal for everyone. It can be considered a vegetarian meal by adding only vegetables if you choose. The soup is able to be spicy or non-spicy, making hot pot suitable for anyone. Its easy set up and cooking method is practical for those who are an expert at cooking or without skills. Hot Pot compliments the scene for food parties or a quiet dinner with relatives. Hot Pot has made an influence around not only China but other Asian countries. This has resulted in other countries adding their local version of it. Other countries now enjoy Hot Pot even some restaurants abroad still prefer to go with the traditional Chinese style. Hot Pot has found a home in Vietnam, Japan, Thailand, Cambodia and other countries. Hot Pot is a meal that can bring people together. Hot Pot just wouldn’t have that nostalgic feeling without a circle of friends surrounding it. In many restaurants, you just might notice groups of co-workers together or big family outings. Key language you must know about Hot Pot. Shuàn means, to scald thin slices of meat in boiling water. Means Completely Spicy Hot Pot. Means a light broth or clear soup. Used for non-spicy Hot Pot. Means half spicy pot, half non-spicy pot.